BTW, I use the term “normal” deliberately. The climate of the last 30 years or so is what we are used to, and it is also the standard definition of the WMO. Besides, why should the temperatures of the 18thC, for instance, be regarded as “normal”, particularly when we know the Little Ice Age was exceptionally cold historically. Two more charts offer a good indication of what is happening. This year did not even figure on the list, with a high of 14.5C. 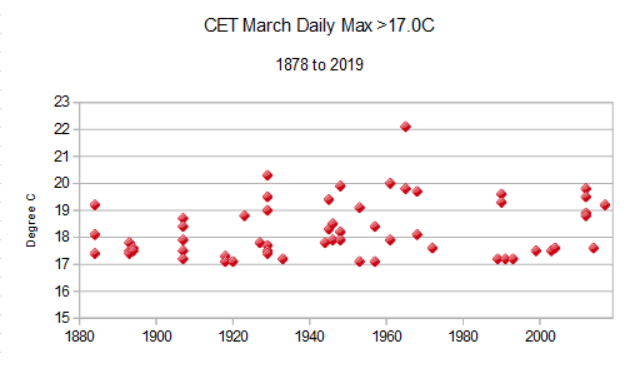 Since daily figures became available in 1880, there is no evidence that top temperatures in March are getting higher, or that these warmest days are becoming more frequent. March 2018 sticks out like a sore thumb with those four days at the right of the chart, one of which was the coldest March day in the whole series. (These are daytime temperatures, by the way, ie daily maximums, and not daily minimums). But apart from last year, exceptionally cold March days have been virtually non existent since the 1970s. At the start of the series in the 1880s, they were very common. 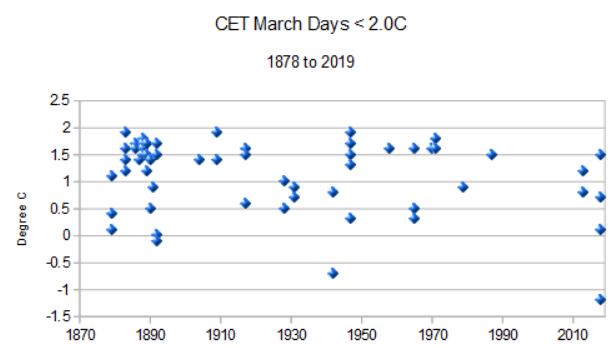 When we look at the rise in monthly mean temperatures in recent decades, we are not observing days becoming warmer, so much as the coldest days becoming less common. Put simply, our climate in March is much less extreme than it used to be.